£25 Bonus when you join Wish Bingo NOW! 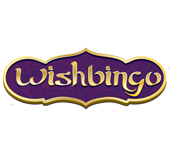 Wish Bingo flew onto the bingo scene in the twilight of a misty Arabian Night aboard a magic carpet. Onboard the magic carpet was a friendly blue genie living inside a golden lamp who granted bingo players all of their wishes! 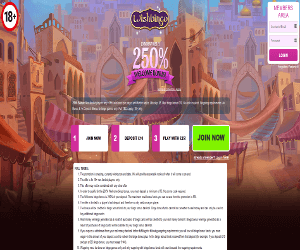 Players are sure to appreciate Wish Bingo's beautiful oriental theme and purple, gold and blue colour scheme. Players are greeted at Wish Bingo like an Arabian sultan with a handsome welcome bonus of £25 when they sign up with £10 deposit. Wish Bingo's free bingo rooms are open to all players whether funded or non-funded. At any given time Wish Bingo has at least three FREE bingo rooms playing 24/7, so there's always a free bingo game to play. Wish Bingo also has exclusive free bingo rooms for first-time depositors! Wish Bingo also hosts an incredible selection of featured games including Fluffy Favourites, Millionaire Genie, Sugar Train Slots and loads more!